Igloo at Indian Hill Elementary in Ohio? 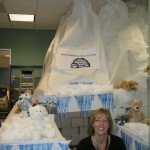 Look at the igloo that Joan Welsh dreamed up and created from copy paper boxes, paper, cotten and shelving. The kids answered questions and competed for the chance to come read in the igloo. They were curled up in this book nook. It was to celebrate my book about Antarctica. Another thing that set the tone in this school was the welcome boards outside each room. Something about having that personal note, right at the door, seemed even more welcoming than the usual note on the blackboard in the classroom. 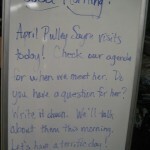 The kids pause, see what’s up for the day, and enter the classroom in a more focused way. Plus, the signs lets other faculty/staff know a bit of what’s happening in each room.